~The Lord Showed me back in February of 2016 during worship at my church that Trump would be president. I saw him serving 2 terms. I saw him in the Oval office laid out in a humble surrender over a carpet that was shaped as the USA land. As he laid their the Lord Jesus came and Anointed him. He was anointed to be the next president of the United States of America. I then saw a beautiful garden grow around him from this Carpet he laid on prostrate in humble in prayer for this nation. God was going to prosper this nation during his presidency. March 2016- I had a dream at a restaurant with a head director of a well known prophetic site called Elijah list that I work for. We were having a lunch together with my youngest daughter present. I told him in the dream that Trump will be president and serve 2 terms. He was curious as to why I believed that, I explained to him in the dream about the anointing that a leader carries and what goes on behind the scenes comes out in the open in a greater level over those they lead. It meant that If a Pastor was doing a secret sin that would be an open door that would effect that church spiritually. So in regard to the nation for presidency that would open a spiritual door to whatever anointing the next president carried. Then end of March after I was finishing up my personal prophecy paintings, The Lord was asking me to paint Trump. I was nervous at the Idea because I knew that not many would at the time receive it. But I thought, If I did not Risk, I would miss out either way. So I obeyed. I risked it. I was told to finish by April 28th. I finished by April 27th and posted it already that night. Then I was asked to bring my painting to my small prophetic gathering that meets Thursday nights. I brought it. And that night, several from my church prophesied and prayed an open heaven over it. I was told by the Prophet of the church to whom my Pastor Recognize as, that God spoke to her and said to pray for Jennifer and the painting. She told me she was about to go home, but then w and as told to stay by God. I was so encouraged to hear that. As nervous as I was in risking this prophecy in painting form, I felt encouraged by my church family. I then could see a week later More of the candidates dropped out. And Could see and learn of more people getting words that Trump is the Prophesied President. This Oil Painting is for Trump when I get invited to give it to him. 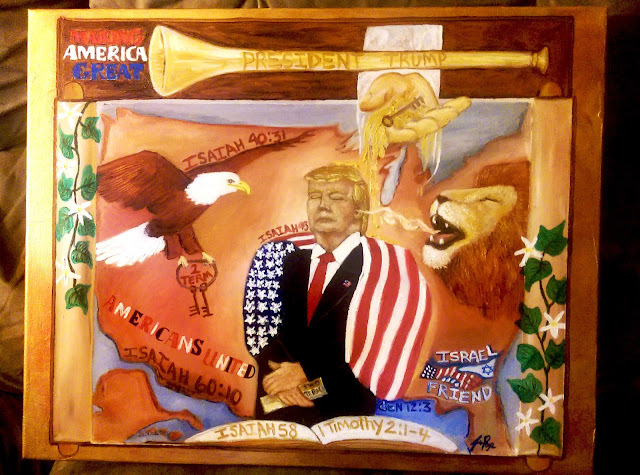 This was a vision the Lord showed me to paint of Trump. What you see posted is the stages of the painting. And the final that he will receive. THE LORD TOLD ME TRUMP IS GOING TO BE PRESIDENT AND SERVE 2 TERMS. THAT HE IS GOING TO SPEAK TO HIM AND TRUMP WILL HAVE AN EAR TO HEAR HIM, AND THAT DURING HIS TIME OF THE 8 YEARS HE WILL BE PRESIDENT THAT UNITY AND GROWTH IN AMERICA WILL HAPPEN. THE LORD HAS CHOSEN THIS MAN. * The Lion breathing wind in Trump ear means God ( symbol for Jesus) Speaking to him and that he has an ear to hear. * The eagle on the Left is the prophetic voice, the encouragement given to Trump during the 2 Terms served. * The Golden Trumpet means his Gifts and prosperity that follows him and as a Trumpet is loud , so is He in presence. * The Word ( The Bible) of Trump coming out of it is a Fulfilled word of our time and As Trump stands on the Word upholding the Truth using The Word as a platform in Righteousness and Justice, He will then be honored by God in his time of serving as President. * The vines that blossom is the growth America will experience in Unity and prosperous land during His 2 term Reign. * The Scriptures I encourage you to look up as the meanings from the Bible will bless you as Such on the painting is : Isaiah 40:31, Isaiah 45 ( Also shows the kind of Leader Trump is), Isaiah 60:10 ( What Trump said about building a wall), Isaiah 58 ,not so much the fasting part that is a focused point but the rest on how to treat others, 1 Tim is about praying for our leaders over us, Genesis 12:3 is why to bless Israel. * Americans United means sometime during his Presidency, America will be united more so than within the last 100 years. 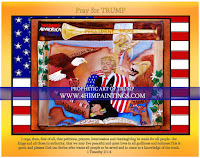 * Trump With Eyes closed means He is in Prayer, and will lead a nation through prayer. 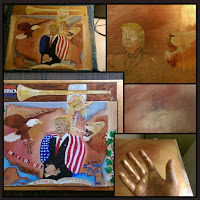 THIS IS FINAL UPDATED PAINTING TO SEE THE ORIGINAL ELEMENTS BETTER FOR TRUMP. WHEN HE ASKS FOR IT, HE WILL RECEIVE THIS AS A GIFT. THIS PAINTING WILL ONE DAY BE IN THE HANDS OF TRUMP. THIS WAS MADE TO ENCOURAGE TRUMP AND ANYONE ELSE CONCERNED WITH GOVERNMENT. AS GOD SHOWED ME THIS VISION EARLY APRIL 2016.